Engage all is a striking and fielding game that gets everyone involved. The game encourages teamwork and thoughtful placement of the ball. A ball is hit off a batting tee into the field. The batter runs around their teammates and all fielders must touch the ball. When all fielders have touched the ball, the fielders call ‘STOP’ and the batter stops running. 1 run is scored each time the batter runs around their teammates. Rotate players in the field regularly. How can the batter run around their teammates faster? 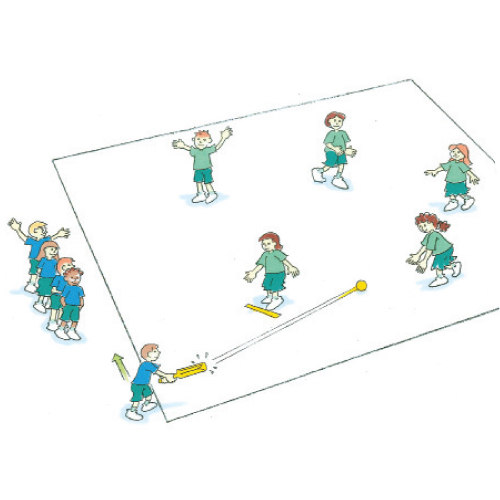 How can the fielders pass the ball faster to each other? Where is the best position to place yourself in the field to stop the ball?